Present state: The two platforms remain along with the two stairways from the street level ticket office. The roadside building also still stands on the east side of the viaduct; it is a William Hill betting shop. The building has a commemorative plaque. Notes: The line on which Bow Road station was located is called the Bow Curve. It was opened by the London & Blackwall Extension Railway (LBER) on 2 April 1849. This line served the first of three stations on the site, named Bow & Bromley which was located on the viaduct south of Bow Road. The station was provided with two short facing platforms and a crossover. If there was a connecting service, trains would run on to an interchange station at the junction with the Eastern Counties Railway (ECR) called Victoria Park & Bow; otherwise services terminated at Bow & Bromley. The original intention had been to build a junction with the ECR main line between Bishopsgate and Stratford stations and run through trains from Fenchurch Street but initially the ECR refused to sanction a physical junction, Victoria Park & Bow being a terminus of the LBER. The ECR was not particularly co-operative in stopping many of their services at Victoria Park & Bow, and in the March 1850 Bradshaw, the only ECR services to call at Victoria Park & Bow were the 6:07 am to Norwich on weekdays and the 1:37 pm to Norwich on Sunday. In the London-bound direction there were no weekday services at all, and just two services called on Sunday at 1:05 and 9:28 pm. The East & West India Docks & Birmingham Junction Railway was incorporated by Act of Parliament on 26 August 1846. It was empowered to construct a railway from Poplar and the docks to Camden Town in north London, including a junction with the London & Blackwall near Bow Common providing them with a route into Fenchurch Street. The new line, now known as the North London Railway (NLR), opened on 26 September 1850. It had its own station at Bow, 50yd east Bow & Bromley on the north side of Bow Road. With the opening of the new line, the LBER saw no future for their service which was withdrawn on the same day with the closure of Bow & Bromley station and its platforms at Victoria Park & Bow. Some ECR trains continued to stop at Victoria Park & Bow until complete closure of that station on 6 January 1851. An Act of 25 June 1850 compelled the ECR to provide a junction with the LBER. On 13 April 1854 the junction between the two lines was eventually opened and the LBER became part of the London Tilbury & Southend Railway (LTSR) route with trains running either into Bishopsgate or into Fenchurch Street via the Bow Curve. By the 1860s, the railways in East Anglia were in financial trouble and most were leased to the ECR. They wanted to amalgamate formally, but could not obtain government agreement for this until 1862 when the Great Eastern Railway (GER) was formed by amalgamation. The London & Blackwall Railway (LBR) was leased four years later in 1866. As suburban traffic was increasing, the GER authorised the construction of a new station at Bow Road on 24 March 1875; the station was to be built on the site of the former Bow & Bromley station which, at that time, was extant. The new station was inspected by Col. Yolland RE for the Board of Trade on 29 September 1876. Col. Yolland was satisfied and Bow Road station opened to passenger traffic on 1 October 1876. No plans of the street level building have survived but it is believed that the booking office was in the arch beneath the line with an entrance on the west side of the bridge and steps up to each platform. There was a small coal office on the east side of the bridge. The two facing wooden platforms were 300ft in length and cantilevered off the viaduct. In December 1878 the GER agreed to extend the platforms across the bridge. This work was put out to tender on 8 April 1879 and awarded to M. Patrick & Sons at a cost of £644; the work was completed that year. There was a signal box with seven levers on the north side of the bridge on the up side. On 3 September 1881 there was a collision at Bow Road when a train ran into the back of a stationary train which had failed at the station. The driver and fireman of the moving train were killed and 11 passengers were injured. In the inquiry that followed, the cause was deemed to be the failure of the signalman to protect the rear of the train by setting signals to 'danger'. The train crew were criticised. Although they had noticed the signals were not at 'danger', they had failed to inform the signalman. The guard of the first train was also criticised for not having properly protected the rear of the failed train. A second accident occurred on 26 October 1888 and, once again, it was a signalling error; on this occasion there were no casualties. In the late 1880s a small goods yard was opened south of Bow Road passenger station. It was located on a cramped triangle of land between the Blackwall Extension and North London lines and bisected by the London Tilbury & Southend Railway. It handled domestic coal, bricks, building materials and general merchandise and was equipped (in GER days) with a 5-ton capacity crane, 7-ton cart weighbridge and a small goods lock-up. The yard was closed in 1964 and the Bow Triangle Business Centre now occupies the site. Since 1850 Fenchurch Street had been the London terminus for the North London Railway using the connection with the London & Blackwall south of Bow station. It soon became clear that the NLR needed its own city terminus and this was provided with a new route from Dalston to a terminus at Broad Street which opened on 1 November 1865. The service into Fenchurch Street was retained as a shuttle service from Bow. It was soon losing money and following the takeover of the NLR by the GER and the opening of the new Bow Road station there was little point in running the half-hourly shuttle which carried an average of 28 passengers. A decision was taken to withdraw the service which would be replaced by better interchange facilities between Bow Road and the former NLR station at Bow. In order to achieve this it was necessary to resite the station to the north side of Bow Road; from here a covered walkway would be provided to link the north end of Bow Road station, on an embankment, with Bow station which was located in a cutting. This would be similar to the existing interchange facilities at Hackney Downs. The contract for new station was awarded to Messrs Kirk, Knight & Co. at a cost of £9276. Signalling work between Gas Factory Junction and Bow Road was awarded to Messrs Saxby & Farmer on 3 March 1891. Plans for the new station were submitted to the Board of Trade for approval on 23 July 1891. The station was completed in nine months and on 19 March 1892 it was inspected by Major General C J Hutchinson RE. With a few minor alterations opening of the station was sanctioned and this took place on 4 April 1892. From that day the trains that had run to the North London station at Bow were diverted through the new Bow Road station, to complete their journeys at Stratford or Forest Gate. The new station was more substantially built than its predecessor with a street-level booking office on the east side of the Bow Road bridge. The façade of the single-storey red-brick entrance building was in a classical style with a parapet (or blocking course) concealing the roof. There were three bays, each with a round-headed opening and keystone, and enclosed by pilasters. The central bay was stepped forward of its neighbours. The west and central bays each had a pediment, but it seems that none was provided over the east bay. Access to the platforms was by two brick-lined stairways with an iron and glass roof. The stairs to the down side were reached by a subway. 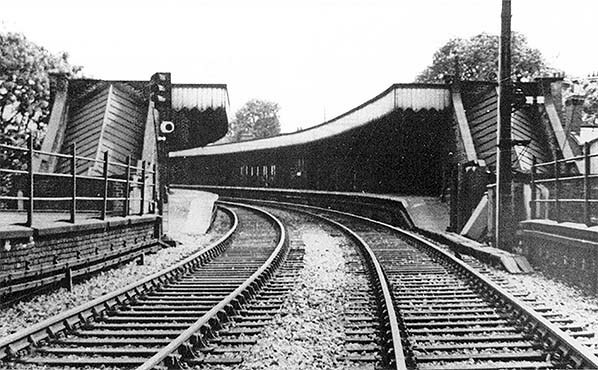 The two facing platforms, which were built on a sharp curve, were 500ft in length and for most of that length were provided with substantial awnings with a deep valance; the awnings stretched the full width of the platforms. Half-way along each platform was a range of timber-fronted buildings. Beyond the platform building on the down side a new signal box was built replacing the previous box which had to be demolished to allow for the construction of the new platforms. When it opened, it had 20 levers, five of which were spare. A crossover was provided at both ends of the station. At the north end of the station, there were similar stairs and a subway which gave access to the interchange walkway to Bow station. At the end of the subway there was a second, smaller booking office for passengers who needed to rebook before making their ongoing journey. North London line tickets from here show ‘Bow No 2’ whilst GER tickets showed ‘Bow Road (EO)’ indicating that they were issued at the Exchange Office; one such ticket is illustrated here. Beyond the exchange booking office there was a long covered walkway which brought passengers onto the northbound platform of Bow Station. Passengers travelling south would use the footbridge. A doorway from the walkway led onto Avenue Road (now Kitcat Terrace); it is believed that this was used as an exit. After closure, the first station building was used as a coal office, later as an auctioneer’s premises, and then in 1912 was converted to a cinema until c1914; it then reverted to being a coal merchant's office, serving that purpose into the 1950s. On 16 July 1907 a contract was awarded to Eastwood Swingler for a new bridge at Bow Road at a cost of £989.16.3. assenger use of Bow Road and Bow stations was in decline in the first decade of the twentieth century when, in 1902, the Whitechapel & Bow Railway opened a more direct link into the city with its own Bow Road station opening on 11 June. 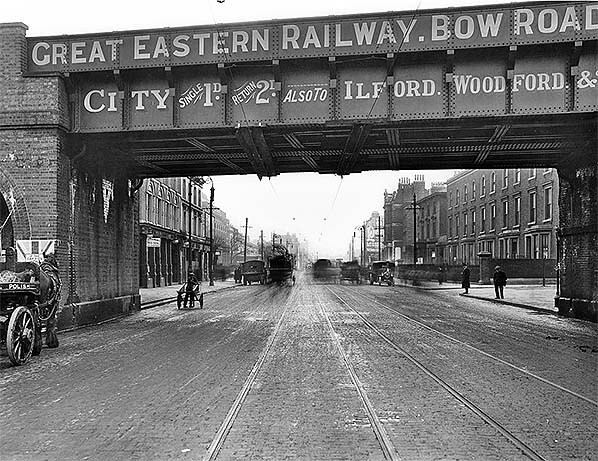 There was further competition for passengers a few years later with the arrival of electric trams along Bow Road, although this service suffered operational problems until July 1909. With falling passenger numbers, the walkway between Bow Road and Bow stations was closed in 1917 as a wartime economy measure and it never reopened. This interchange facility was, of course, the reason for resiting Bow Road station yet it lasted for only 25 years. In the July 1922 edition of Bradshaw, on weekdays the first country-bound train from Fenchurch Street ran at 6:20 a.m. with the last at 9:53 p.m. The journey time was around 12 minutes (assuming that trains stopped at all intermediate stations, although some did not). Journey time to Stratford was then a further six minutes. Most trains went as far as Ilford. In the opposite direction the first train to Fenchurch Street departed Bow Road at 5:49 a.m. and the last at 9:30 p.m. Bow Road station came under the jurisdiction of the London & North Eastern Railway (LNER) after the 1923 grouping. Bow Road signal box was abolished on 3 March 1935 as part of a modernisation scheme for the Fenchurch Street line which included the installation of electric signalling. The Sunday service at Bow Road was withdrawn from 5 May 1935. In late 1936 the LNER announced the electrification of the Shenfield line which would include Fenchurch Street - Bow Junction. Although work started on this scheme it ceased after the outbreak of WW2. On 21 April 1941 the station was closed; it is unclear if this was as a wartime economy measure or as a result of damage following German bombing raids during the Blitz. Photographs from the time show some minor damage to the station. Bow Road re-opened on 9 December 1946 but it received very little use and quickly closed again on 6 January 1947 to allow for modifications to be made during the electrification of the line. These included new concrete lamp posts and a shortening of the awnings with now only protected the top of the southern stairs and the platform buildings. Although Bow Road once again appeared in public timetables from 16 June 1947 the service to Fenchurch Street was shown as ‘suspended’ and the station did not reopen to passengers until 6 October 1947 with a much sparser service than pre-war. There were no up trains stopping there between 8.44 am and 4.14 pm and a similarly poor service for down trains. On Saturday there were no trains in the afternoon or evening. Following nationalisation of the railways in 1948, Bow Road became part of the Eastern Region of British Railways. Passenger numbers remained very low and a planned electric shuttle service between Fenchurch Street and Stratford was scrapped. Regular passenger services along the Bow Curve were withdrawn and Bow Road station was permanently closed from 7 November 1949. The line was retained for diversions and for this reason overhead electrification was installed. In 1954, the street level building was leased to a company called L Power & Sons Ltd. They were electrical engineers and also manufactured neon signs. They remained in the building until 1979 when it became a betting shop. At this time the original brickwork was rendered. At track level the platforms and buildings remained intact, but the buildings were demolished in October 1967 leaving only the brick stairways up to the platforms at the south end of the station. The Bow Curve was reduced to a single track c1986 to allow the Docklands Light Railway's Poplar-Stratford branch to share the alignment north of the station. In 1990 the building was included in the ‘The Bow Heritage Trail’ and was provided with an oval blue plaque with the words ‘Bow Road Railway Station on the London & Blackwall Railway’, with an incorrect construction date of 1869. The trail does not have a good record for accurate dates. At Bow station, there is a similar plaque stating that the station opened in 1870 when it actually opened in 1850! As of 2017 the line is not in regular passenger use but is still used for diversions and empty stock movements. Both platforms still survive and the street level building is a William Hill betting shop. The brick-lined stairways to the platforms also survive. 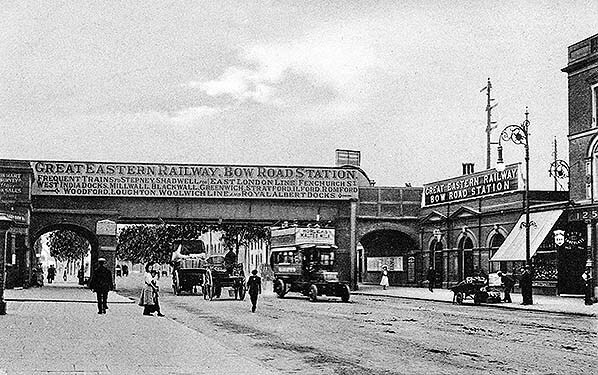 The bridge over Bow Road, part of the A11 which was once the Bank of England (later cut back to Aldgate) - Newmarket - Norwich trunk road, seen here sometime prior to July 1907 and looking towards Mile End Road. The station entrance, right, still stands in 2017 and the bridge, minus sign, is little changed. Part of the earlier street level building is seen on the far left; the entrance was on the far side of the bridge. This is a typical Edwardian street scene which displays a number of historically interesting features. The large sign on the bridge was once a common sight as railway companies promoted their own destinations and often connecting services of other companies. Such advertising became more relevant with the coming of electric trams. Of the destinations seen here, Greenwich will refer to the now-long-closed North Greenwich London & Blackwall station while Woodford and Loughton eventually became stations on London Transport's Central Line. Note that East London Line is preceded by 'for' and the line's name is shown in brackets. There would have been another of these signs on the other side of the bridge. Beneath the arch on the right a comprehensive display of posters can be seen while the vertical board to their right probably advertises places reachable by train from Bow Road, although the list, if that is what it is, appears more comprehensive than that on the bridge. Up on the viaduct a signal post carrying bi-directional arms - once a very common practice - can be seen. On the road, horse-drawn and hand-propelled transport predominates. Difficult to see among the ruts, potholes and horse muck are tram lines of the North Metropolitan Tramways’ horse-tram service; soon after this photograph was taken the route was electrified under the auspices of London County Council (LCC) Tramways. A sign of things to come was the motor omnibus (the full name 'omnibus' was still then in common use) seen heading east under the bridge. The omnibus has proved difficult to identify but under magnification it appears to be a Straker-Squire. The operator's identity is even more difficult to establish but a clue is the branding on the bodyside tumblehome. It is either Thomas Tilling or Union Jack and the styling suggests the latter. Union Jack was a branding used by the London Road Car Company, which was swallowed up by the London General Omnibus Company in 1908. The 'General' was the originator of the world-famous London red bus livery which was perpetuated by London Transport, of which the 'General' became a part upon its formation in 1933. Public transport along the Bow Road is described further with the 1915 image. Also of interest are the delightfully ornate street lamps. Not only is there a large lamp overhanging the road, there are also two smaller lamps on ornate brackets further down the standard. These lamps were probably the work of the City of London Electric Lighting Co Ltd, formed in 1891 and which had a generating station at Bow and also owned Bankside Power Station, Southwark. The lamps along Bow Road would, at this time, have been DC as were many early electricity supplies. Joseph Cross's Map of London 1850. The first station, Bow & Bromley is shown as is Victoria Park a&Bow, the interchange station with the Eastern Counties Railway. 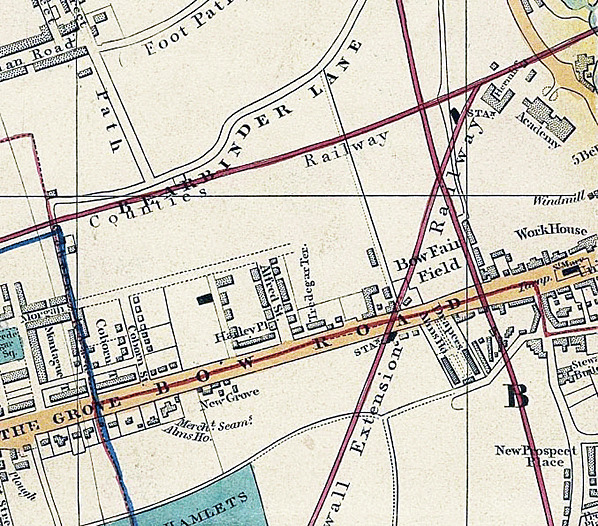 The North London Railway, which at this time was under construction is shown, but there is not yet a Bow station. 1870 1:2,500 OS Map. Bow & Bromley station is shown but is not named as a station because it had been closed for 20 years. 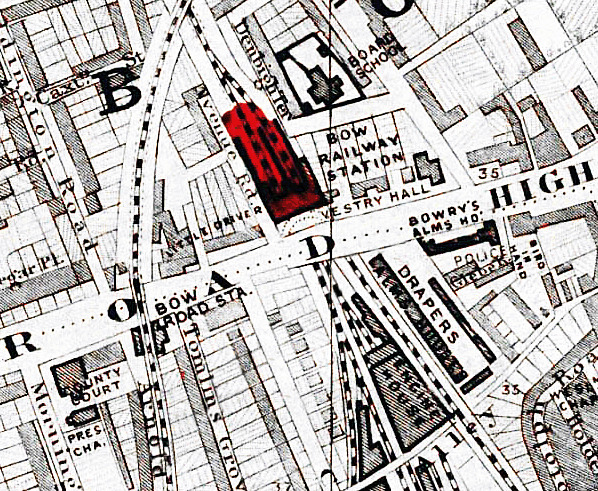 Bow Road station would not open on the same site until 1875. Stanford’s Geological Library Map of London and its Suburbs 1878 shows the second station which opened in 1875. It is clear from this map that Bow Road station had a similar footprint to its predecessor Bow & Bromley. 1950 1:2,500 OS map shows Bow Road station in its final form. Although the map was published in 1950 the survey was made in 1948. The platform awnings have been shortened and now only protect the top of the stairs and the platform buildings. The hatching on the stairs indicates a glazed roof. The stairs at the north end of the station and the exchange booking office are shown as a ruin; the covered walkway is still shown. The previous station buildings have gone as have the signal box and crossover. A small building has appeared on the down platform to the north of the platform building. 1950 1:2,500 OS Map shows the very cramped Bow Road goods yard sandwiched between the Bow Curve and the North London Line with the Southend running over it on a viaduct at its south end. The 1956 Railway Clearing House Handbook states that by that date it only handled general goods and still possessed a 5-ton capacity crane which is seen between the sidings to the left of the word 'coal'. The yard closed on 7 December 1964 and its site is now occupied by the Bow Triangle Business Centre. Click here for a recent aerial view. Looking through the bridge over Bow Road during, it is believed, 1915 and in the opposite direction to the 1907 view. The station entrance is out of view beyond the arch on the left. Unlike WWII when the greatest danger was the Luftwaffe's bombs, the only aerial threat in WWI was from occasional Zeppelin appearance. Scenes from WWI, such as this, are therefore difficult to recognise as wartime. There is, however, evidence in this view in the form of the poster partly obscured by the cart and its splendid shire horse on the left. It was a variation of the 'Your Country Needs You' theme and played upon the expression 'If that caps fits, wear it'. This particular poster reads "If the Cap Fits You" and was of course a rather clever part of the recruitment campaign for the army. The poster is based upon the Union Flag and was one of several variations of the same theme issued during 1915. By this date (see the 1907 view) the tramway had been electrified. Electric trams along the Bow Road served routes 61 (Aldgate - Bakers Arms) and 63 (Aldgate - Ilford), which continued as such under London Transport from 1933. Most of London's trams north of the river were withdrawn prior to WWII, the exceptions being routes 31, 33 and 35 via the Kingsway Subway, with many being replaced by trolleybuses. Upon conversion, the former Bow Road trams became trolleybus routes 661 (Aldgate - Leyton) and 663 (Aldgate - Ilford Broadway/Chadwell Heath). East London lost most of its trolleybuses from 1959, those along Bow Road going on 19 August that year. The bus replacements comprised seven routes, of which only the 26 (Aldgate - Leyton) bore any resemblance to a former trolleybus route. Beyond the bridge and on the right is a steam lorry, or steam wagon as they were known at the time. It is too far away for a positive identification but given the year it is most likely a Foden. Up on the bridge the large sign seen in the 1907 view has gone and been replaced by simpler advertising painted onto the girders. The emphasis is now not so much on the range of places served but more on the fares to the City and probably in an attempt to counter tram competition. Modern eyes may imagine a painter frequently changing the stated fares but there have been periods in our history when fares and prices in general remained static for many years, either to fight competition or simply because of a very stable economy. Beneath the bridge deck two trough-like devices can be seen. Probably of wood, their purpose was to prevent the tramway overhead wires from contacting the bridge as they rose slightly owing to the upward pressure of trolley booms. However, under examination of a larger view there appears to be section isolators beneath the bridge, in other words a short neutral section. Looking north from Bow Road bridge in August 1942. 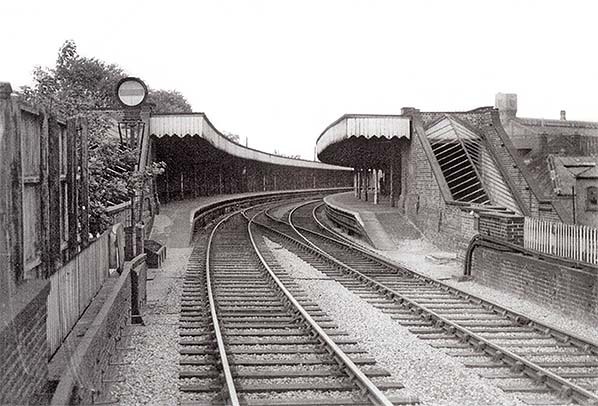 At this time the station was still as built with awnings stretching the full length and width of the platforms. The station was closed at this time, the only damage appearing to be the glazing on the stairs which was removed following damage in an air raid. The signal on the left is a Banner Repeater. They repeat the aspect of a signal further ahead where curves or structures obscure a driver’s view. The disc rotates so the horizontal bar mimics a signal arm. These signals are still used but today LED displays have replaced rotating discs. Bow Road station looking south in August 1942. Although closed since 1917 the stairways that led to the interchange booking office and the covered walkway to Bow station appear to be in good order and still retain their glazing. Colour light signalling was installed on the Fenchurch Street in 1935 but an old semaphore signal is still seen on the right. This is the signal with which the Banner Repeater seen in the picture above worked in conjunction. The semaphore would have been linked mechanically to the Repeater, which may explain why it is still in use following the installation of colour lights.